The multipurpose design of the COLLABORATE Room PHD offers high quality audio and video for broadcast-grade video conferencing. The COLLABORATE Room PHD is a full-featured system that offers ease of operation, top benefits, and the right mix of quality and features. 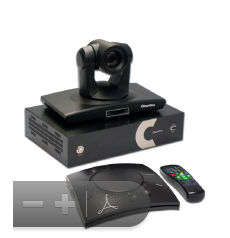 This system's full video conferencing functionality enables built-in recording, streaming, and data sharing. The best video conferencing system of its kind with the lowest cost in its class, the COLLABORATE Room PHD lets you "be there" and contribute to workplace efficiency while enjoying a professional video conferencing experience.